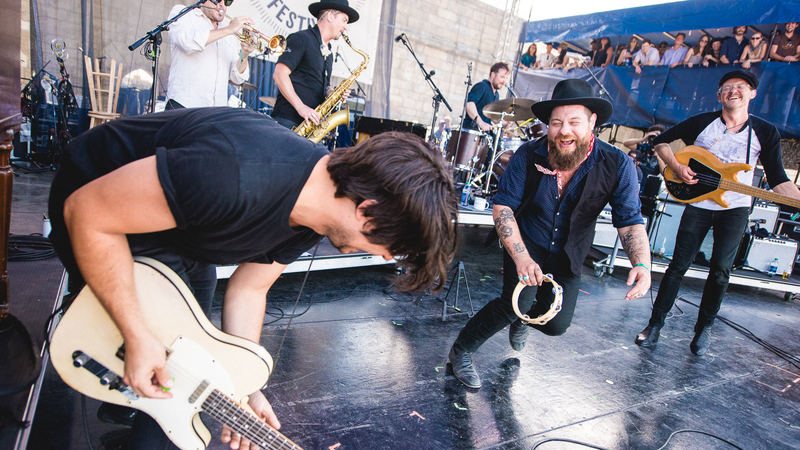 Nathaniel Rateliff & the Night Sweats have had quite the year since they played the 2015 Newport Folk Festival last July. Back then, the rootsy soul band was just getting ready to release its self-titled debut album, which would be vastly well received, thanks in part to a couple of barn-burning performances on late-night TV. Rateliff and company have been touring basically nonstop ever since. Performing this year on the festival's biggest stage, the band worked through simmering soul grooves and hip-swinging honky-tonk. Toward the end of the set, Rateliff brought out Delta Spirit's Matthew Logan Vasquez, who joined the Night Sweats on guitar for their big hit, the gritty stomper "S.O.B." Interpolated with The Band's "The Shape I'm In," it made for a raucous, shout-along dance party. Hear the whole set on npr.org. "We've Got The Whole Night Left To Lose"
"S.O.B." / "The Shape I'm In"